It’s 82° F, the sun is hot with that crisp, polarized light you see only in California and the Mediterranean. It’s breezy, the birds chirp, the jasmine is out, causing entire neighborhoods to reject their desert status and cradle everyone with a gentle scent instead of coating them with brake dust. Even though the city is always breathing under the burgeoning cloud of a devastating earthquake, and the traffic is enough to make the most patient monk let loose with godless obscenities, you won’t forget these kinds of early spring days. It’s the kind of day where it seems one’s only goal should be cocktails with good friends, and taking the shortest possible path of least resistance to get to that point. Hopefully, this music will assist. I’ve posted other easy-going Congolese rumbas in the past, however, some of my favorite discs from this period are actually from a bit later, from the late 1950s-early 1960s, featuring the Congolese cha-cha-cha. It’s driving, sharp rhythm hits home the fact that some of the most carefree and joyous Latin music of the 20th century came out of the two cities on the river in the Congos. Many of these tunes were sung in Spanish by the Congolese – sometimes broken or improvised Spanish, but Spanish nonetheless! The Congolese cha-cha-cha apparently began in the studios of the short-lived but influential Esengo label. 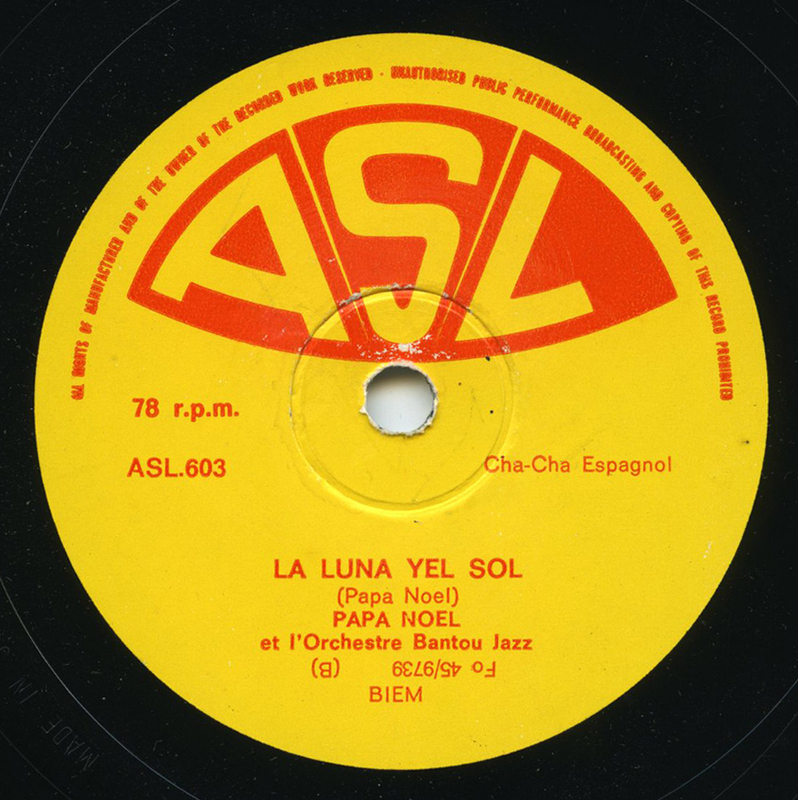 In late 1956-early 1957, the Greek-owned Esengo had purloined many of the area’s most popular stars from other labels, essentially creating stellar supergroups with a stock of talent that would become the mainstays of music in the Congo for decades: Joseph “Grand Kalle” Kabasele, Nico Kasanda (aka “Dr Nico” or simply “Nico”), Nedule “Papa Noël” Montswet on guitar, Tino Baroza, Jean Serge Essous, and Nino Malapet on saxophones, and Moniania ma Muluma, also known as “Roitelet” on bass. This group, with additions and subtractions, in various shapes and forms, became the famous Orchestre Rock-A-Mambo, contributing to or issuing about 250 records on Esengo over approximately 4 years. This release of this tune was meant for the Kenyan market. ASL (Associated Sound Limited) was an independent label that distributed Congolese pop music in East Africa. Their South African pressings are particularly clean. ASL lasted well into the 70s, but at this point in their murky history, they were issuing (guitarist Nico would claim bootlegging) 78s of original material from the masters of other Congolese labels, such as CEFA and Surboum. Bootlegs or not, the sound quality, pressing quality, and musical quality of the material on this label is tremendous. Wow. Thank you. Especially for the guitar solo. It unfolds like a rosebud. Lovely. There’s also a touch of Spring where I am today, in the east of England, and this will do very nicely as the soundtrack. Great song- and what a guitar solo! Wow!